Friday I tried my hand at painting sky and I hated it. You're not really building structure as much as you're pushing colors around. So now I know. There are a couple of colors that I still haven't gotten yet, so Erik was giving me some alizarin crimson here. I asked for pointers on how to warm up the palette on this earlier painting, I figured out how I wanted to fix the foreground snow while walking Buster and now it's glazed and done. We watched Alexia Saturday night so Mommy and Daddy could go on a date. She and I spent about three hours drawing at the kitchen table. I've been practicing pen and ink strokes and showed her how. She had several pens to chose from and we so we just drew in the afternoon sun together, while Grandpa fixed her favorite spaghetti and meatballs. We watched several episodes of Dance Academy, an Australian TV series/soap about teens in a premier ballet academy in Sidney. We finally cut her off after five. Her post-it notes are for the next morning - more Dance Academy, breakfast, ride home and more Dance Academy and also some random pen and ink strokes. Then she played Toy Balls on my iPhone. Incidentally, if you saw the movie Strictly Ballroom, the woman who played the young gypsy dancer is the head teacher in this TV series. Love Netflix! I haven't been spinning this year due to an elbow that is painful after each spinning session. I'm resting it and doing other fibery pursuits, including knitting some of the massive backlog of handspun yarns. I'm obviously going to have to change my spinning technique when the elbow is recovered. Maybe change sides? So I cut out this single knit for another tunic. I have no idea why this caught my eye at Mood, but at $14 a yard, I'm going to wear it, even it's just here. This fabric is so hard to work with. It's almost impossible to get wrinkle-free and flat. It makes me even more in awe of those designers on Project Runway who shake out a piece of shear insubstantial fabric and cut it to size. This looks just as bad on me as it does in this picture. This is the next piece - kind of a modern art non-pattern pattern. I have no idea what's going to happen in the cutting. As you can see on the lower right corner, they had given someone an 8-9" swatch and didn't compensate when they cut it for me. It's been sitting for several years so I'm going to run it through the washer and dryer again before I try to figure it out. I'm reading a couple of books at once. Okay, I never just read one, but I'm sure that's been apparent in the past. Sleepwalking Through History by Haynes Johnson. I bought and read this about 15 years ago but it's been on my mind a lot lately so I'm re-reading it. It's the Reagan era and how it came to be and it's surprisingly relevant to now in this anti-government era, which I totally don't get. Newt insists Reagan passed the mantle on to him and he is channeling Reagan. Last Man in the Tower by Aravind Adiga, winner of the Booker Award for White Tiger. It's complex, full of rich characters with unexpected humor. I think we'll be able to expect that from him in future books as well. Gideon's Corpse by Preston & Child. It's a ridiculous plot-driven book that kept me up until midnight last night, and it will probably do the same tonight. We've finally gotten some snow, the fourth of this water year. It's keeping Ian busy, filling the bird feeders. We feed many mouths here. What the songbirds don't get falls to the ground and is snatched up by the quail. And what the quail don't eat, the cottontails do. I can't keep them out of the yard so I'd just as soon they eat fallen seed than dormant plants, though most everything is inside rabbit guard cages for the winter. I chose a photo of Peterson Mountain for the exercise in my second class. The first class was about seeing everything in three tones, or even five, and this class was about seeing things as 70/30%, and because the horizon in my photo was right in the middle, Erik told me crop it. I marked the cropping but seeing the entire photo confused me. The painting wouldn't come together and Erik asked me why I thought I this one was so difficult. I didn't think about the cropping until later. Sandy came over today and we painted together for a couple of hours. We have a lost of fantastic natural light in our house. She's working on a sign of our CERT team mascot - we're the Red Rock Rattlers. Charlie wanted to be part of the action. As long as he stayed put, it wasn't a problem but he became obsessed with drinking from our water bowls. 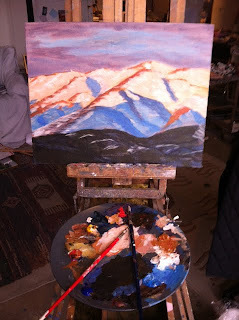 I'm using my dad's old table easel. You can see my photo taped above the exercise and how I taped over the areas I was cropping. I painted out some areas and lightened the palette and am going to stop for now. I'll have Erik help me with it on Friday, or if time doesn't permit, at least critique it so I can repair it later. I love acrylic because you can paint over the problems, no sweat. I just wish I could figure out what I want to paint instead. It's all part of training my eye. "At this time I rec'd a letter in Dawson- asking if I would like to see the Fair and sell tickets - which I did. I left Dawson the day after Xmas - making the 500 mile trip over the frozen trail to White House, from there to Skagway via train to Seattle by boat. I picked up a dog team there and took it to St. Louis. It was there that we put our dog teams together and were married." We had a fabulous downpour of rain last night and the fire is now 100% contained, though 29 homes were lost and a 93-year-old woman perished. The prior firestorm was in a upscale area and I felt distanced from the event. This fire touches everyone. It occurred in a corridor that you must drive through from Carson City to Reno. It's an area of small ranches running along a stream with very old trees. I remember my first time through there and the Merry Wink Motel signs spaced incrementally. "He who drives while half asleep is now buried six feet deep." Gone. It's all gone, though they did save Governor Sparks mansion, and I cannot imagine how. I saw the shell of friend's house in the flames. The origin was improperly disposed of fire place ashes. The individual has stepped forward, though I cannot imagine where that will go since he's an elderly man. Ian always worried about disposing of our ashes. Don't worry - he digs a hole. 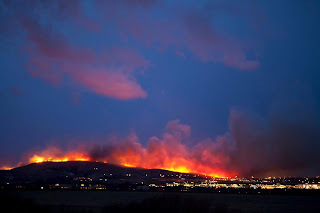 The fire moved with terrifying speed in the winds, so that people just released livestock to run free. They're still trying to get that straightened out. We heard a report on the number of animals still unclaimed at the livestock event center - I forget the total, but Ian and burst out laughing as the list ended with a donkey, a llama and a goose. You look for humor where you can find it. I wanted more than anything to just paint today. Erik and I talked over my painting from yesterday, and I had myself set up to paint before lunch. I just bought this crepe pan and so decided that the best plan was to make dinner, then paint my brains out, and afterwards put dinner in the oven. Here it is, ready for the fridge. It's just two cups of medium white sauce with Costco rotisserie chicken, tarragon, mushrooms and peas. I added some dry white cheese for the last five minutes when I cooked it, and it was fabulous. Excluding the price of the pan, it cost $2.00. This evening, I slit open a stuffed Christmas ornament that didn't get packed and shoveled in some catnip. I thought Charlie would be amused. I didn't stitch the slit shut. Charlie made a mess of things. Ian was not amused. The ornament/toy is no more. Ian and I are in the midst of setting up a trust for our kids. I thought I'd quickly get things set aside that need to be photocopied, only I couldn't find one deed. After looking in all the logical places, I invoked my new year's resolution by accident - to clean up our filing cabinet. I came across amazing things, including my grammar school report cards, my ACT scores from when I applied to San Diego State College and my drivers license from when I lived in the Philippines in 1971. I did find the deed. I also found many documents and receipts that are no longer relevant. I think that's about 8" worth of paper. I'm not done, but I wish I were. No painting, just paining~ugh. From my Kindergarten "Report to Parents" - Sharon knows her telephone number; she is able to recognize the numbers from 1 to 10. Sharon enjoys sharing experiences with other children. She should be encouraged to close cupboard doors quietly, sit in one place during storytelling time and be a good listener. Sharon is promoted to beginning first grade." Our ISP has funneled the email part of their service through Google and I'm trying to follow directions to get my computer and phone to work. I turned on my computer this morning, anticipating a call to our ISP for assistance, when suddenly emails began to download, and download. In the end, I had something like 800 emails. I couldn't deal with it as I had lost a contact in my eye last night and wanted to have my eye doc see if he could see it since I certainly couldn't. I decided to make a Costco and Trader Joe run to justify the gas expense. My friend Melissa called while I was driving in and we ended up going for some Macy's therapy. She needed some cheering up and we always have fun at that store. Today we browsed handbags. You have to laugh at the price tags, if nothing else. When we left the mall, she said I smell smoke and so did I. I returned Melissa to her coffee house, got my eyeball checked, then did my shopping. There was a reason we smelled smoke. I listened to NPR and every half hour got an update on the fire. It started south of Reno and was being fanned by the terrific winds, pushing in the storm front supposed to hit tonight. I had to fight the car door to keep it from being ripped off its hinges. Gusts in excess of 70 mph were reported at the airport and flights were being delayed or cancelled. 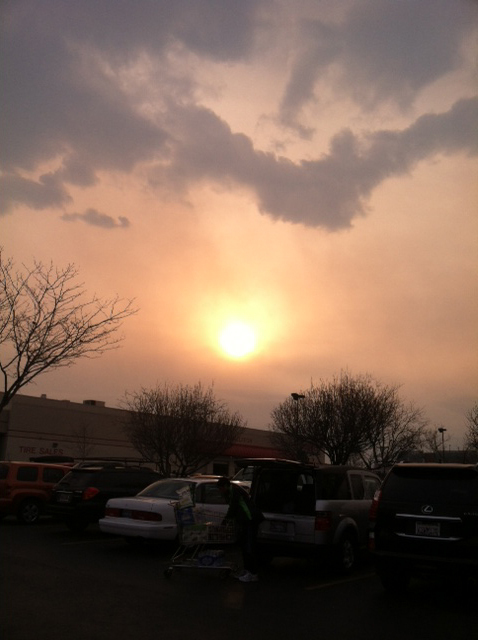 My last stop in Reno was Costco and when I came out, the smoke was choking. You couldn't see the mountains and barely the sun. I snagged this image from Facebook. Like the rest of the country, we've been warm and dry, until last week when night temperatures hovered around zero. They confirmed 3,000 acres burned, 20 homes lost and one fatality. Horse evacuation has been a crisis. The fairgrounds can hold 400 and outlying ranches are offering accommodations. Our VFD truck was headed south as I drove home, about 5:00. It's Thursday, our VFD guys have worked all week - and now they're fighting a fire all night. I'm concerned and I want them to be safe. I wonder how that works when they're supposed to be at work tomorrow. Meanwhile, I got a text from Ian when I was at the grocery store - last stop before home. He'd heard that North 395 was closed both ways due to a pile-up, and warned me to take surface streets. It turns out that fifteen vehicles and two semis had collided in white-out conditions when the gusts blew alkali across the highway, reducing viability to nothing. Eight are hospitalized. Whadda day. I was glad to get home in one piece. As for the massive email downloads - I was able to take a look at it this evening. It was all the email that I had sent or received from my smart phone, dating back to 2009. Think about that when you put something in an email. It's out there. Somewhere. On a more pleasant note, I finished another UNC school spirit garment, this time a hat for our grandniece. I'm going to suggest to her mother that she take the Christmas hat and trade McKay for this one. I think it will be cute for the two kids to have spirit apparel. If you look on the map, midway on the right, you'll see the number 395. We drive through California on our way home from Reno on Hwy 395, and at that number is exactly where we turn off onto Red Rock Road. If you've ever driven north from Reno to Susanville, you might know this spot. We are within a mile of the state line, so our power comes from the Plumas Sierra Electrical Cooperative in Portola, California and our telephone service is provided by Rural Telephone in Glenns Ferry, Idaho. That might help explain why we're so anxious to get emergency training out here. I love our service providers. Rural Telephone gives us long distance to Reno for a flat rate of $5 a month. I learned that value when were were building and my phone bills to our contractor were $30 a call. Yeah, that was before cell phones. Even so, I can call for a doctor's or hair appointment at no more than $5.00. That's valuable because cell service here is pretty wretched so far. How weak? If my phone rings, I have to grab it, tear through the French doors and get to the edge of the deck - and then we can talk. Weather permitting, the call may go unanswered. A couple of years ago RTCI decided to lay cable and provide us with DSL service. We were more than happy to say adios to satellite internet, however, we're still in the sticks and we've had less than slick days. Slick Day: This week RTCI is migrating their virtual email service to the cloud, i.e., Google Aps. Those who don't use Microsoft won't be affected, but I'm stuck. My emails are in the cloud and my address is resident in my Outlook. I'm sure there's a solution but apparently not an obvious one. On a good note, I finally got my iPod restored to communicate with my iTunes library after it has boycotted it for a month - second visit to the Apple store this month and a success. I have tunes to drive by and even though I'm totally bummed about Outlook, I'm calling this day a success. That's because Eleanor and I both had stellar check-ups, and are good for many more miles. Ian and I started the day meeting with an attorney, to set up a trust so our kids don't get socked with the Spanish Inquisition. If you're not a Monty Python, I apologize. On on that note, I think I'll say good g'night, Gracie. It's been a few years now since I got hooked on Noro Kureyon sock yarn. Several of you expressed skepticism that a single ply thick-and-thin yarn would hold up in areas of wear. It doesn't. I thought felting these would make them better but it just made them smaller. Even the pair I knit most recently has no heel. The other pair I have is missing a heel and the ball of the foot. I have two more skeins of this yarn and have no idea how to get it out of my stash. You skeptics were right. And for those of you who asked how I liked working with Polypay, I thought it was delightful but I was working with unusually short staples lengths and would love to try this again with a sample from one of Luke's ewes. It's not as springy as Targhee but very close. Again, a sample from a mature animal might have different characteristics. It's soft and I think would be terrific for garments. I'm not sure about weaving with something this boingy - would have to ask for advice if I want to take that further. As for the appliances, we have an online subscription to Consumer Reports. I was restricted by the size of our tiny laundry room so needed machines that were 28" deep or less. CR rated the washer I chose as Best Value which was this. The dryer was also well rated. They are certainly well rated by me. They are so quiet and yesterday when I did my first load of whites, they came out white! I didn't know a washer could make that kind of difference. I put my finished sweater through a soak cycle yesterday and blocked it. It was dry today so I brought it downstairs. It's taken me so long to knit it that Charlie has taken to think of it as his. The bedroom was about 60 today and yet he found his sweater and took a nap. It has been brutally cold all over the West Coast recently. It was -10 this morning and Ian ran into problems with the hydrant at the llama shed. It wouldn't turn off and was soaking everything and everyone. He ended up turning off the power to stop the well from pumping, put a nozzle on the end of the hose, and then called our wonderful pump guy who recognized the problem, explained it to Ian and told him how to fix it. When the power was back on, of course, we were running brown water from every faucet. I sewed today and I love my tunic. However, sewing with single knits is like sewing with Jello. I have four more pieces that I bought from Mood. I WILL sew them up and then I'm never going to sew with single knits again. I have no idea how Theresa cuts out four projects at a crack and then sews up a complex garment in an afternoon. I worked on this over three days! The power of friendship. This would have been a good photo yesterday for MLK Jr Day. And Becky. I'm actually assembling notes on growing up with my parents for my children since they never knew them as vigorous energetic icebreakers in the original back-to-the-land movement. My kids only knew them as elderly grandparents. So Becky. I have no record and no one to ask about when she arrived or when she left, but she was with us for a couple of years. She was in secondary grammar school and couldn't compose a small narrative. I remember that upsetting her teacher who called Mom in. Many people worked to save Becky. A widower in our valley raised horses and was the man Daddy had fix our old cars. Becky discovered she loved horses and couldn't spend enough time after school at Joe's to suit her, which worried Mom to death. Joe taught her to ride and to drive a sulky. Her dad would visit once a month and take her for an ice cream cone. She thought he was god, and then was surly toward us for several days afterwards. She had lived with us for a couple of years when her uncle in Wyoming discovered she was in foster care. Even his mother knew. He was beside himself because it was intolerable to him. As a newlywed with two young children and a small farm, he didn't have money to send for her. He and Mom started to correspond. Long distance still wasn't common or practical. They cobbled together a plane ticket and Mother sewed like mad so Becky would have new clothes to wear home. That's a way Mother showed her love - she sewed for you. Becky was just about in 7th grade when we took her to Lindbergh Field and she boarded a DC6 for parts unknown. I've thought so many times how skinny and scared she looked. She and Mom wrote letters for years and we stopped by to see her after I graduated from high school, after attending Daddy's family reunion. She was so proud to show off her family. The last letter Mom got, Becky had enrolled at the community college studying social work and was engaged to be married. Mother thought that Becky stopped writing because she had moved out of her past and was moving into her future, though I know Mom would have welcomed a letter. The rest is up to Becky. I've been without a washer and dryer now for about three weeks, and in spite of two loads at my sister-in-law's house and two trips to the laundromat, I was faced with this backlog, not including sheets and towels. It's taken two days to get through this, and today was my first load of whites in the new machines. They were white! I've never had whites like this before. The machines are electronic and startlingly quiet. We don't have to close the laundry room door to talk, which pleases Charlie since his litter box and food are in there. I'm not going to like paying for them, but I sure do like using them. It's been an expensive month and Wednesday is what I hope is the last expense. Eleanor, my car, and I both have doctor visits. She is way past due for her check up and I'm going to have part two of mine, which was actually in December. However, I made such as mess of my lab work, that my doctor wanted a do-over. A new windshield and new tires for Eleanor and we should be on all clear. And broke. I forgot to mention than Ian got me a Kindle Touch for Christmas so we are now a two-Kindle family. He adapted easily to my Kindle 3 and we're keeping it registered in my name so both devices share one library, which is more than any two people can read. I knew I'd like the Touch but I didn't realize just how much. I'm currently reading A Tale of Two Cities for my book club and find it's pretty painless, sliding through the pages. The group wanted to read a classic this year and on my, we certainly are. They can't opt out, but as facilitator, I'm stuck so I just keep tapping the right side of my screen as I glide through this most depressing book. "It was the best of times, it was worst of times" and so far it's only the worst of times. I joined Amazon Prime in December and we used my account to buy all our Christmas presents since shipping is quick and free. A lesser known part of that package is that you can check out a book from their Kindle library every calendar month. My January book is I shouldn't even be doing this by Bob Newhart, an autobiography. Since he was a cutting edge stand-up comedian, this is also a history of the genre - and funny. My mother was determined to provide me with a sibling in the form of a foster sister since she was too old to have children after me. After the County turned us down for having well water and worn linoleum, Mom turned to a private foster care facility for troubled children, funded by the parents who didn't want them - and so when I was in junior high school, Rebecca came to live with us. She had impetigo from the nervous habit of licking her lips and kept pulling her hair out. My mother and Becky's case worker met once a month to iron out strategies to save this forgotten little girl. I knew when Mrs. Gilliam was coming because Mother feverishly wrote notes and cleaned the house. When she came, I was invited to go outside. The thing I've thought about in retrospect over the years is that Mrs. Gilliam wanted to save Becky as much as my mother did, only this was before the Civil Rights Legislation of 1964 and Mrs. Gilliam, though a college educated woman, did not have the right to vote because the color of her skin was black. Yet she devoted herself to saving the skinny, troubled white kids in her charge. I've had this refrigerator magnet for at least 15 years but today on MLK Jr Day, I thought of it and I thought of her. I post the picture in her honor. And yes, they did save Becky. Erik Holland is a local artist and 10-year resident of the Riverside Artists Lofts. We're friends on Facebook and when he posted that he was offering a five-week class starting January 13th, I thought it sounded just like the thing I had been looking for - open ended, any medium. He said the class was limited to five, to put a check in the mail. I did. I've been interested in two-dimensional art, probably all my life. Both my grandmother and father were oil painters. I've taken classes in every medium so I dragged my materials to this class. I felt this might be the opportunity to find me. Two dimensional art has been illusive. And this is where I'm set up, my canvas and my palette. Marilyn, his neighbor from downstairs, came up to paint with us. He said a student had given him this toilet and since there was no where to put her table palette, the toilet was put to service. I had a fantastic time. I knew I'd love acrylics, but I just didn't know how to use them. I'm not looking to frame anything. Moving the paint and color is the fun. I had that experience when I took a community college oil class when my mother was failing. The teacher was terrible but the fun of creation was fantastic. I have four more sessions in this class, and boy did I get lucky. He only teaches a couple times a year. He offered this class for a friend. We're going plein air for the last couple of classes, if the weather holds. I was walking back to the parking garage with all my bags and my wet painting, when I couldn't pass this shot of the Truckee River. A young man walking by with his two small daughters, stopped and said, that is a really nice painting. My first one! I wanted to kiss him but I was covered in paint and I would probably have scared his girls. Erik said our homework this week is to look at everything and assign three values to it. I cannot believe that I pulled off the road on my way home, all because now I'm seeing everything in three values. This tells you also that it's still cold and dry here. It was 10 degrees this morning when I pulled out onto the highway. This is my first exercise in acrylics. It was such a satisfying experience and I had a blast. It's the first art class I've taken where I wasn't an anxious nervous wreck. I'm in way over my head, but there are no grades and I don't care. Ian was on duty at home. These are the old appliances. These are the new, and I can't wait to try my new high efficiency washer. I think I love laundry. We have to get flexible dryer ducting to be able to push our machine back. 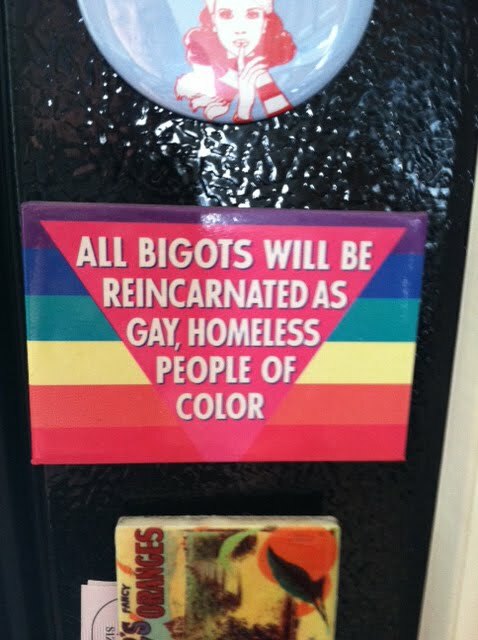 We're not sure on that, but its going to be great to see the piles of dirty clothes go away. I don't understand what people do with their clothes if those don't wash them every week. I don't understand how people schedule laundromats into their schedules. This experience has humbled me. Joe called me last week - long story - but invited us to come down on Sunday afternoon when they were going to finish a wood firing. His daughter Jasmine is a first-year ceramics arts student at NAU Flagstaff and had asked her dad if they could they do this over her break. We were driving back from getting hay the same time he told me they would be emptying the kiln so we stopped by to see it was going. A wood fired kiln requires many potters to keep the fire stoked, so many potters had pieces in the kiln. The inside of the kiln looks much larger than the outside. They had a long way to go and we had hay to unload. Time to go home and get on with the rest of our day. That little black bag on the top of the hay? Is this. Luke handed me a bag and said it was the smallest one, since it had to ride in the cab with us. He thought it was two lamb shearings, and it is. The potential is fantastic, but I'm going to ask for a ewe sample next time we get hay. The staple length is no more than 3" at best. I wasn't impressed by the fleeces but I couldn't stand not to know what the fleece had the potential to be and had to scour a sample. I drum carded and spun up a sample today. He has the potential to sell lovely fleeces. I hope I can help him identify the good ones and then get them to buyers. This sample couldn't be worse which tells me that he's got great stuff in that yarn barn of his. He's my neighbor in the rules out here. Neighbors help neighbors. As for the purple scarf I took for trip knitting, this was the frogatage. As you can see, it was skinny and un-neck warming. There's a lot of yarn in this worm bundle. It needed to be done. That skinny scarf was worthless. Another froggage. The knit/purl pattern I chose was gobbling up the yarn. I had to frog and this is where I am. It's working out well as a TV viewing project. Ian and I are currently watching Michael Palin's New Europe series on Netflix. I dragged down the Atlas from upstairs to help me follow along, only he started in Slovenia. My atlas had a unified Yugoslavia. I had no idea my atlas is so old. I ordered a new one and it should be here before we watch the next episode.